Venezuela’s capital Caracas has been ranked as the world’s deadliest city for a second year in a row, while Latin America still dominates the annual list with 43 of the 50 most violent urban centers. 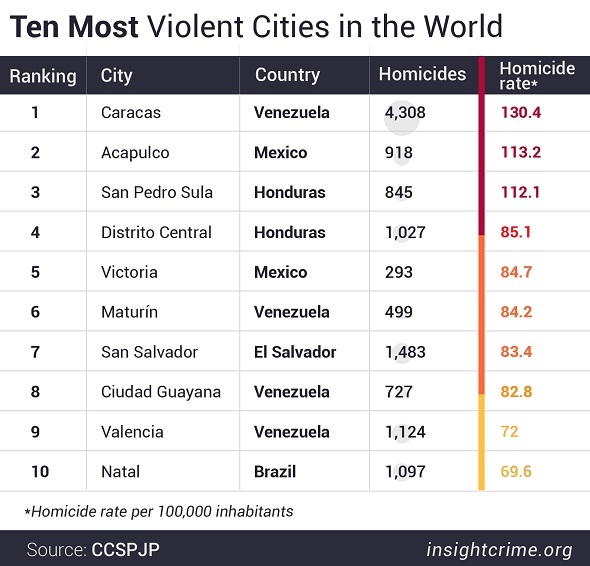 According to the yearly ranking by the Citizen’s Council for Public Security and Criminal Justice (CCSPJP), a Mexican non-governmental organization, Caracas was the deadliest city in the world in 2016, with a homicide rate of more than 130 per 100,000 inhabitants. Venezuela’s capital had overtaken this infamous title in 2015 from Honduras‘ San Pedro Sula, now ranked third after Acapulco, Mexico. The 2017 report, presented on April 5, shows that the top 10 is exclusively made up of Latin American cities, four of which are located in Venezuela. Overall, 43 of the 50 cities with the highest homicide rates are located in Latin America and the Caribbean. Only two countries from outside the region appear in the ranking: the United States [St. Louis, Baltimore, New Orleans and Detroit] and South Africa. Brazil, the biggest country in the region, had the largest number of cities on the list, with 19, followed by Mexico with eight and Venezuela with seven. 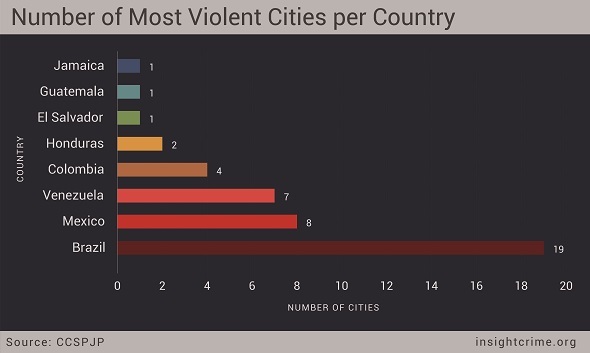 The report points out that the ranking only considered cities with at least 300,000 inhabitants, and that the homicide rate figures are estimates and should thus be considered within a margin of error. Latin America and the Caribbean have repeatedly dominated this annual ranking by the CCSPJP. As InSight Crime previously noted, some of the factors behind persistently high homicide rates in the regions cities include the fragmentation of organized crime groups, growing domestic drug consumption markets and conflicts over trafficking routes, as well as local and national government corruption and lack of capacity. Some of these criminal dynamics may also have been exacerbated by the dire political and economic situation of countries present in the list. In the case of Venezuela, for example, the deteriorating economic and political crises have sunk the country deeper into a state of widespread insecurity over the course of 2016. And various indicators point to the country as being on course for yet another deadly year. Although to a lesser extent, Brazil has also been rocked by both political turmoil, in the wake of massive corruption scandals and the impeachment of former President Dilma Roussef, and growing economic hardship. Budget shortfalls have impacted urban security in cities where the lack of resources of local governments has severely undermined policing efforts. Additionally, the two most violent Brazilian cities, Natal and Belém, are both capitals of northern states of the country. Brazil’s prisons in the north were rocked by gang conflicts toward the end of 2016, which may have spilled into the street and further fueled already high homicide rates. Similarly, in Mexico, shifts in criminal dynamics have contributed to a national increase in insecurity in 2016, which has been seen most clearly in that country’s 50 most violent cities. The CCSPJP’s study notes that, among the changes registered in comparison to last year’s report are the appearance of Juárez, Chihuahua and Mazatlán in the list. These three cities are located in two of Mexico’s most organized crime-ridden states, Chihuahua and Sinaloa.